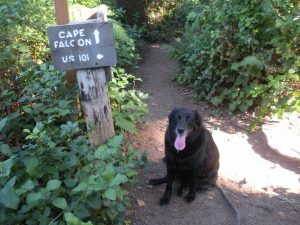 Representatives from a number of state, regional agencies, along with several volunteer organizations gathered at Nehalem Bay State Park’s Meeting Hall on Wednesday, May 23 from 9 am to noon for a Trail Summit. The meeting featured discussion on solutions and action plans to deal with a number of issues facing area trails: increasing volume of traffic, visitor education, pollution and erosion, and limited personnel and funding. Moderated by Steven Blakesley, Health Promotion Specialist for Clatsop County, the summit drew about 30 attendees from a wide variety of organizations and agencies: Oregon Trails Coalition, Oregon Coast Visitors Association, Manzanita Visitors Center, Trail Keepers of Oregon, Oregon Parks and Recreation, Tillamook County Wellness (YOW), and more. “Trails are important to everyone in this room and this is an important discussion,” Blakesley said. After introductions, several speakers addressed the gathering with issues specific to their areas of expertise: Jim Sayce, executive director of the Pacific County Economic Development Council, recounted the initial efforts to build the Discovery Trail in Long Beach, WA; Steph Noll with Oregon Trails Coalition gave an overview of the statewide trail summit in Bend in 2017 and plans to repeat the event in 2018; Steve Krueger of Trail Keepers of Oregon talked about the volunteer crews that repair and restore trails along the Columbia River Gorge and what those efforts look like after last summers’ fires; Lauralee Svendsgaard of Oregon Recreational Trails Advisory Council discussed ways to educate hikers on trail etiquette. “I think we’ve all seen people who aren’t exactly respectful of trails,” Svendsgaard commented. There was also discussion on how best to relay trail care information to visitors and the growing trend of local agritourism, led by Marcus Hinz, Director of Oregon Coast Visitors Association. Overall, the attendees agreed that unified messaging is a big step towards educating current and potential trail users. “We all have to be on the same page or they will receive a hundred different messages from a hundred different people,” Blakesley said.